We are pleased to announce Bibiana McHugh as our keynote speaker for WhereCampPDX 4. Bibiana McHugh has worked in TriMetâ€™s Information Technology Department since 1997 and currently leads a team of innovative web developers and analysts as the IT Manager of Geographic Information Systems and Location-Based Services. Bibiana leads several open data and open source software initiatives including Open Trip Planner, maps.trimet.org, developer.trimet.org, and the TriMet App Center. After initiating collaboration with Google for the first release of Google Transit, she helped pioneer the now worldwide standard General Transit Feed Spec (GTFS). Bibiana received her degree in Geography from the University of Kansas. In the past year, TriMet and Metro have put significant resources into manually improving Open Street Map (OSM) using regional jurisdictional data as a reference. It now rivals commercial routable networks and supports the OpenTripPlanner (OTP), which is scheduled for public release in Portland on Oct. 15th. OTP is now an international open source, multi-modal trip planner that was seeded from a Metro Regional Travel Options grant two years ago. OTP is entirely open: the development method, the software license, the architecture, and even the data. 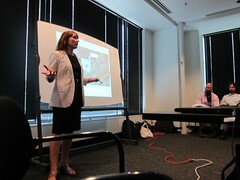 In addition to showing a preview of OTP, Bibiana will also kick-off the first TriMet Apps Contest. TriMet has over 40 applications listed now at trimet.org/apps that are all developed by third parties using open data at developer.trimet.org. This contest will encourage local users and developers to design an application specifically for visitors that will encourage tourism by public transit in our city. Contest details will be revealed at the event. WhereCamp PDX is a free, volunteer-organized unconference for anyone interested in geography and technology. This yearâ€™s event will be held on October 7-9, with a full day of unconference sessions at the Metro Regional Center on October 8th. This entry was written by Reid Beels, posted on September 14, 2011 at 11:30 am, filed under Uncategorized. Bookmark the permalink. Follow any comments here with the RSS feed for this post. Both comments and trackbacks are currently closed.